I keep looking for one more teacher, only to find that fish learn from water and birds learn from sky. If you want to learn about the sea, it helps to be at sea. If you want to learn about compassion, it helps to be in love. If you want to learn about healing, it helps to know of suffering. The strong live in the storm without worshipping the storm. Now don’t we all feel at sea at times, Tossed around by the storms of life. The storms are not life by the way, but they are part of life. I have felt myself at sea many times in my life; I have done so at times these last few months too; my mind has not been as clear as it could be at times. I have noticed I’ve got a little lost at times and I have lost things at times. My services have not been at the standard I would have liked too. I’ve also felt more tired than usual. Now there are obvious reasons for this as I have been experiencing deep grief and concern for my nearest and dearest. We are hoping that some healing will come now as last week we attended our Daniel’s (my step-brother’) inquest in Bradford. It was a deeply painful day. We held one another as we listened and bore witness. I also felt so powerfully, as powerfully as I have ever done, that loving presence holding us as we lived in the storm, but did not worship it. Something has changed, or do I mean awakened within me since Tuesday. I have felt lost at sea quite a bit these last few months, it has changed me, but then it ought to. Living spiritually is not about transcendence, it is about transformation, formation, reformation. I feel that I know the sea more intimately than before and therefore feel better able to help my fellow travellers who from time to time, will get caught up in the storm and feel all at sea. We do not sail the ship alone, we travel in the ship of love together, as one and never alone. I remember during a theme talk at this years Summer School one of the speakers stating something like. “Do not worry if you lose your car, that isn’t the problem. You are in trouble only when you forget that you have a car.” Well last week I thought I’d lost my car, I hadn’t I’d just parked on a different street than I thought near to Sue’s new house. I did though feel that horrible sensation in the pit of my stomach I have felt it a little too frequently in recent weeks. I thought I was losing my mind a little, I wasn’t I was just experiencing what it feels like to be lost. It humbled, it grounded me and it helped me to connect. It certainly brought down any of those barriers I am tempted to put up from time to time. 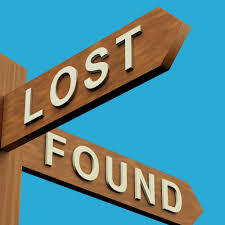 I have noticed, over time, a large collection of lost items appearing in the small schoolroom at Dunham Road. Items like scarves and hats and gloves and sunglasses and ordinary glasses. 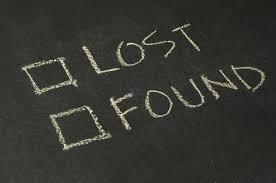 It is hard to know what to do with them, perhaps we need a “lost and found” box. I always remember such things as a child. I remember leaving something important on a bus and two or three days later getting it back as it was handed in and kept in the lost and found box. The same thing happened at the gym a few months ago as I had left my spare pair of glasses there on the Friday and only realised it when I returned on the Monday. Well there they were, a few days later, in the lost and found box. Sadly the same thing didn’t happen with my watch and then a little later my wallet when I left it in the post office after buying stamps. At least I remembered I had them and had lost them of course, now if I'd forgotten I had a watch or wallet that would have signified real trouble. 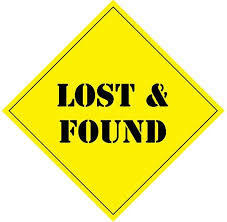 I find something deeply reassuring in the fact that “lost and found” are paired together. There is something very powerful in the journey of faith in their pairing. There is something beautifully paradoxical in all of this. A bit like Nepo’s line, “If you want to learn about the sea, it helps to be at sea.” Gets me to think that if you want to be found you have to first of all get lost. It is the “Hero’s Journey”. If I have learnt anything in life, and this year has taught me this once again and more deeply, it is that the problem isn’t whether or not we will get lot at times, the question is how will we live when we get lost. Now of course the first step towards finding my way again is to recognise, first of all, that I am lost. 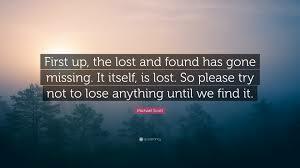 This doesn’t necessarily mean literally lost, but lost in myself, whether that be lost in fear, self-doubt, self-pity, basically lost in my own underpants. When I am lost in myself and find myself truly “all at sea” I find that what has really happened is that I’ve separated myself once again from what I know to be true, about what is at the heart of me and the heart of life and have blinded myself to the light both within and without and I have once again walled myself in and I begin to feel alone and utterly lost. I have cut myself off from others and the love present in life. In such a state I can really do damage to myself and or others. I have done so in the past. I know that this is exactly where our Daniel had found himself, this is clear to me right now as anything has ever been. I know when I am lost, all at sea, internally, I find myself giving in to guilt, to loneliness and defensiveness. While externally I will begin to blame others for this sense of "lostness", resentment grows as does confusion in others. Don’t we all? So when I find myself lost, how do I once again find myself? 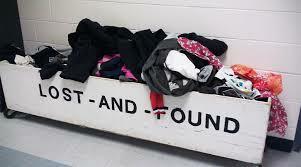 How do I go and look in that “lost and found” box of life? Well it begins, as it did when I left that important item on the bus at the age of 11 or when I lost my glasses recently. First of all I pause and then I ask for help. I ask for help internally and externally and do you know what if life has taught me anything it is that when you ask for help so many people always come rushing. As I have heard said many times, when trouble strikes, when horror and disaster strikes always look for the helpers. When you do it shows the love that is so present in humanity. It restores my faith once again. I am most lost when I’m uptight and frightened. They key to being found is to lighten and loosen up. It requires patience and trust, perhaps the best qualities of faith. When a person is all it sea it is no use to thrash around, you need to be calm, take a breath and solutions usually come, usually you find yourself found. Sometimes you get rescued as someone else reaches through your defences with a kind word and or gentle touch and sometimes all it needs is a gentle word of encouragement and you can once again find your way back to shore. Oh, places I have passed! We are all always on the opposite side of the river to the other riverbank. “If you want to learn about the sea, it helps to be at sea.” To be found you have to first of all get lost. I have learnt that it is important to be lost at times. Whether any of us like it or not, we all find ourselves on the wrong river bank at times, not knowing how to get to the side we would like to. We all find ourselves in an uncertain place, lost and without guidance. We all feel lost at times. By the way we don’t really get lost in the woods and wilderness. Life isn’t really like the fairy tales although they can help us see the reality. These stories have a way of revealing reality through their beautiful mystery. We all feel lost at times, all at sea. I have re-learnt how important that is. It keeps you connected to life and allows you to grow, to be transformed. This is the point of the spiritual life. This year I have learnt once again about vulnerability. Everyone of us is vulnerable to the troubles of life. No matter how comfortable life might be at this moment that can be quickly shaken and all can be lost. That phone call can come, that changes everything, that breaks your heart. The problem isn’t getting lost, we all get lost at times. The problem is in losing faith that you can be found once again. The key is how we live when we find ourselves lost. Do we close down and get lost deeper in our fear, or do we pause and reach out and ask for help from those loving forces that are all around whether visible or invisible.